Had my 2008 Sonata scanned for a check engine light. Came up with code 016 = Cam and/or Crankshaft sensor. Had no trouble identifying the cam sensor, but cannot find the crank sensor. Repair manual has no picture, or figure in anywhere as to the location; states that it's located on drivers side at the back of the engine near the flywheel. I have an '04 Sonata but can't imagine the locations are too different, the crank sensor is at the crankshaft sprocket, you may have to remove the timing belt and drive belt to see it. The 2.4 liter used in the 2008 Sonata is a totally different engine design than the motor used in the 2004 model. The crankshaft position sensor is mounted on top of the bell housing where it buts up against the engine block. See attachments. It is bulkhead side of engine, in corner where ear is for trans mounting just above the oil pan rail.. got to do it from underneath, after taking a couple shields off.. what a piece of work..
have a correlation code.. clear it and see what happen down the road. Likely run into a OCV for CVVT..
LOL...Yeah, you caught me iting the schematics without double checking under the hood of our 2009. I knew better too. SBR711 can you send a picture of where the crankshaft position sensor is located i have been searching for a week? If you still need the location of the cps, I just replaced mine. 2009 Sonata 2.4L, Good luck! 2000 Elantra won't start - cam position sensor vs crank position sensor symptoms? 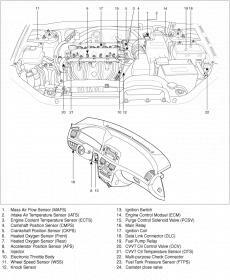 Hyundai Coupe 2001 Crankshaft position sensor location ! !